We had to say goodbye to our sweet Sage a couple weeks ago. 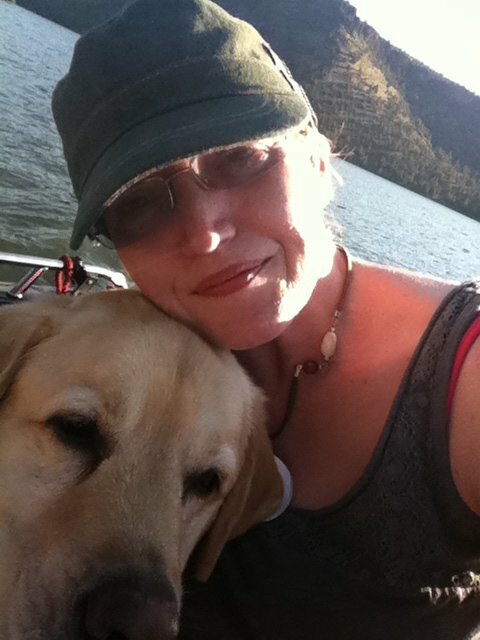 It was awful, as those of you who have lost furry family members know all too well, and we needed comfort. 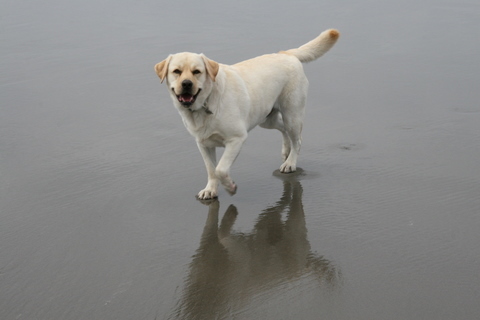 We shed many tears of grief and also of relief because he’d been in such discomfort, we spent a lot of time talking about him and remembering him with the girls, and we did a lot of extra cuddling with our four-year-old lab, Scooter. But after a few days, it was clear we needed something else. We needed cake. Not just any cake, we needed my mom’s chocolate cake, old school style, in a 9x13inch Pyrex pan with her boiled chocolate icing. No fancy layer cake could bring that kind of comfort. 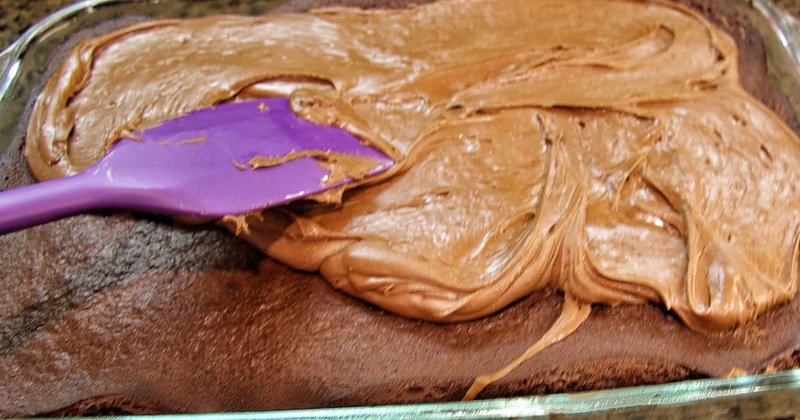 It was still slightly warm when we cut into it and the icing was like a solid layer of silky smooth fudge. I had made a cheesy ground beef pasta dish called Marzetti for dinner, one of mom’s favorite things to make for us growing up. That combined with the cake was like receiving a huge hug from my mom and nothing is more comforting than that. 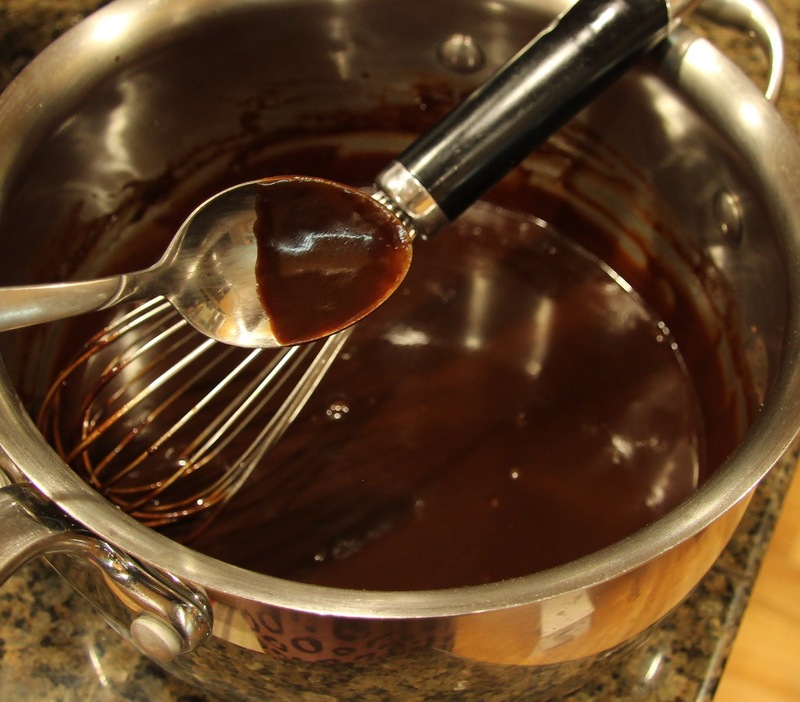 For the cake part – follow the recipe for Mom’s Chocolate Cake (I used 1/2 cup butter added 1/4 cup oil to the recipe to make it moister). 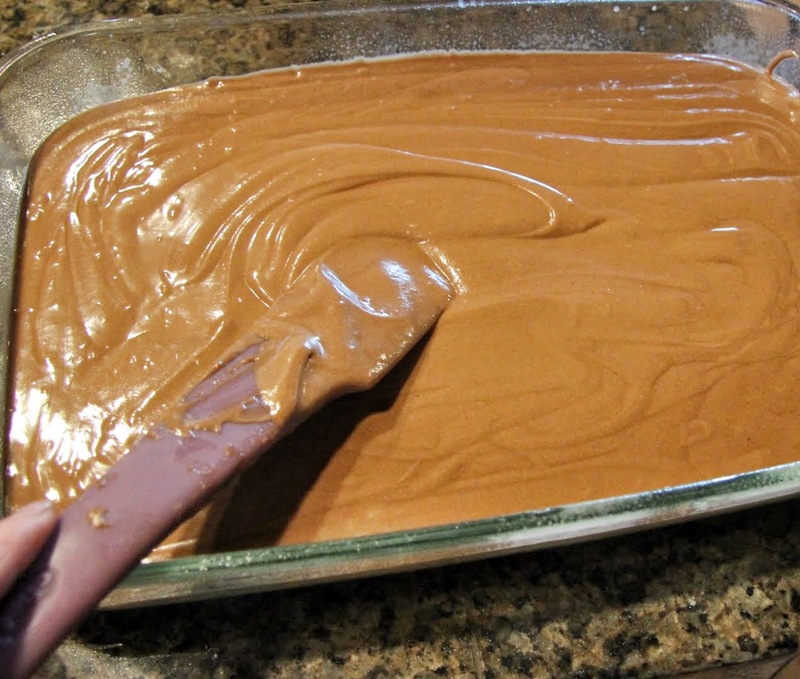 Spray sides and bottom of a 9x13inch Pyrex pan and pour the batter into it, spreading evenly. 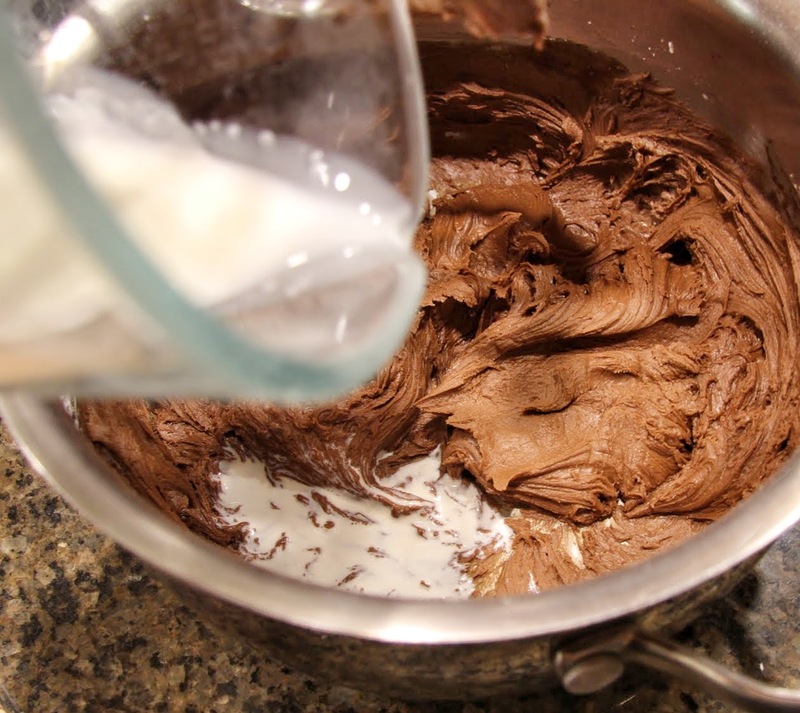 Bake in a preheated 350-degree oven for approximately 40 minutes or until a sharp knife inserted in the center of the cake comes clean. 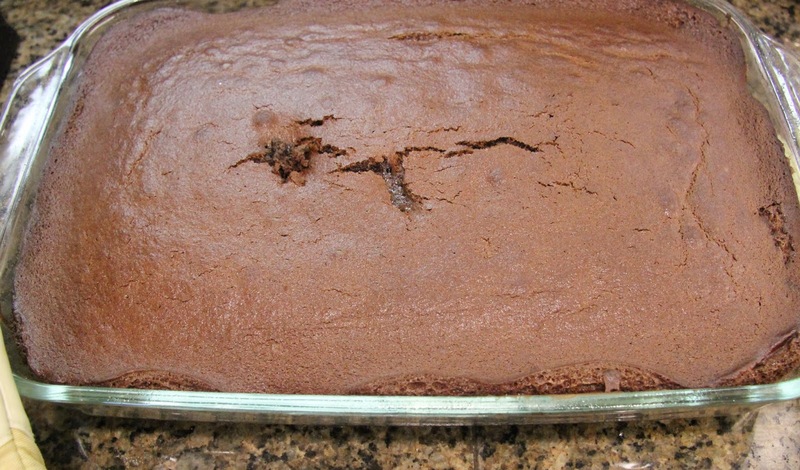 Allow cake to cool before frosting, it’s okay if it’s still a little warm. Just so you know, you will have a strong desire to pick this frosting off the top of the cake and eat it by itself. I encourage you to use restraint because you’ll feel bad about yourself and the cake will look ugly. However, if you can’t help yourself, know that you’re not alone and try not to beat yourself up. And, obviously, if you’re grieving any sort of loss, all bets are off… Go for it. 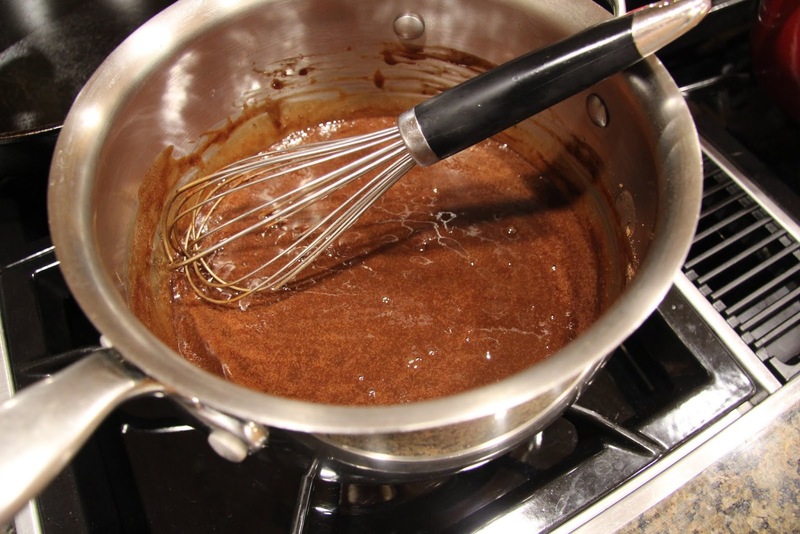 In a medium-large saucepan, combine brown sugar, cocoa powder, 1/2 cup milk and 1/4 cup butter over medium heat. 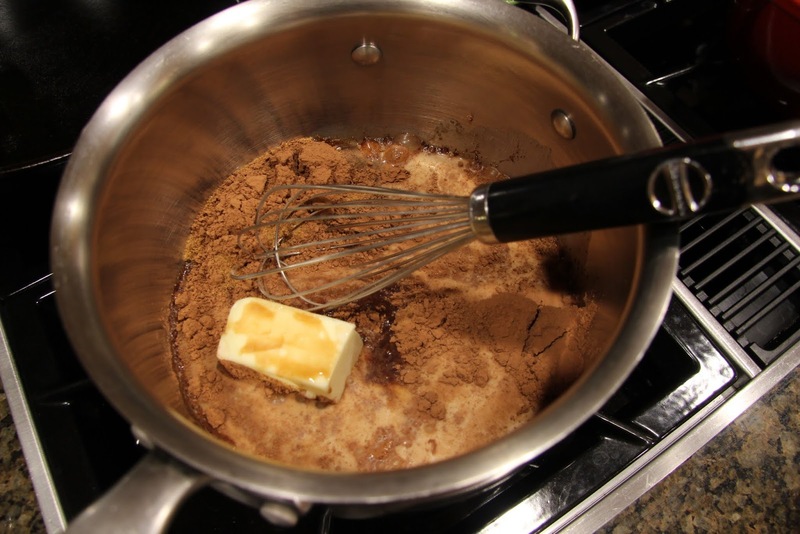 Stir frequently until butter is melted and ingredients are combined. 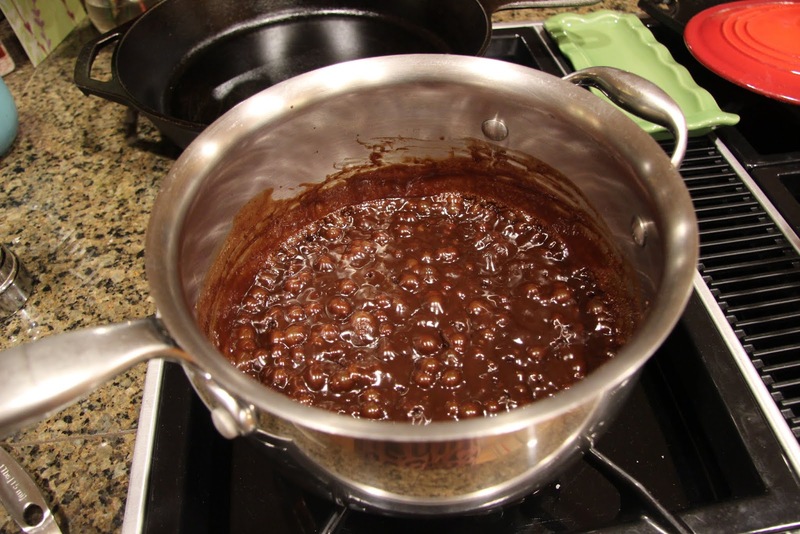 Bring to a boil (turn the burner up slightly to medium-high if necessary, but too much) and allow to boil for 3 minutes, stirring occasionally, after which time the mixture should be thick enough to coat a cold spoon. Remove pan from heat and allow it to cool about 5 minutes. 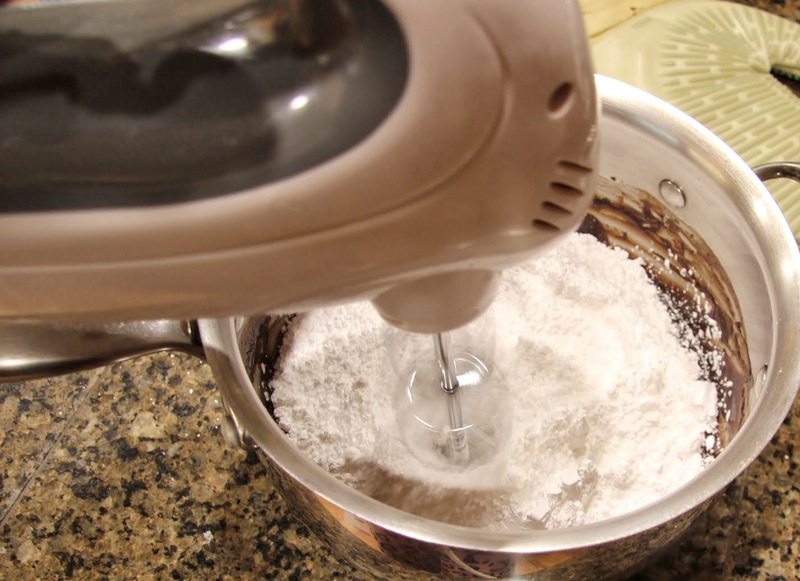 Then add 2 cups of powdered sugar and mix with electric hand beaters until icing is thick but smooth. 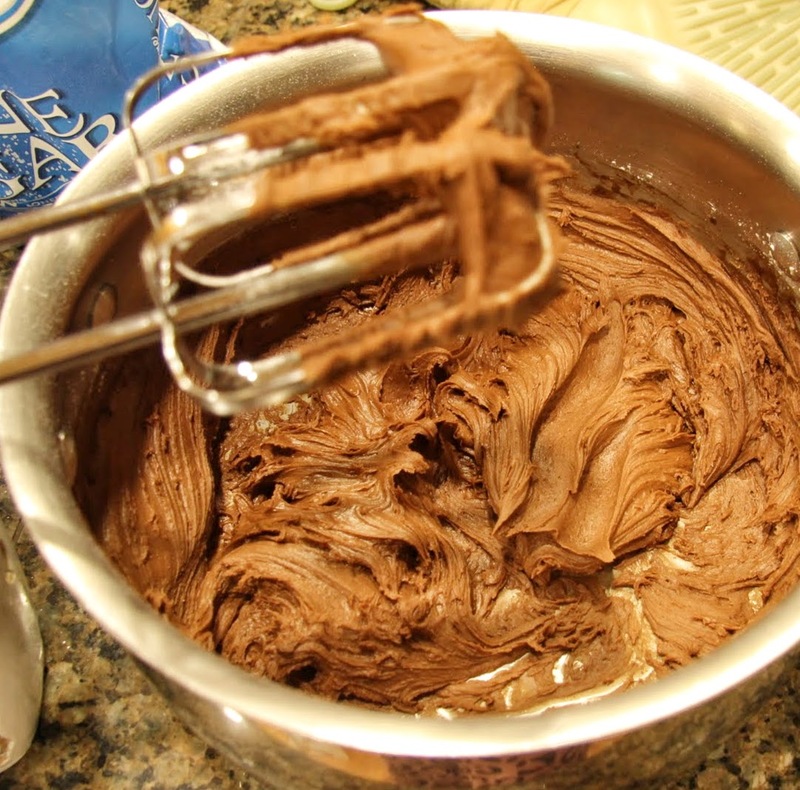 Add vanilla/coffee extract, a dash of salt and 1/4 cup hot milk (just heat it in the microwave) and beat until smooth and spreadable. 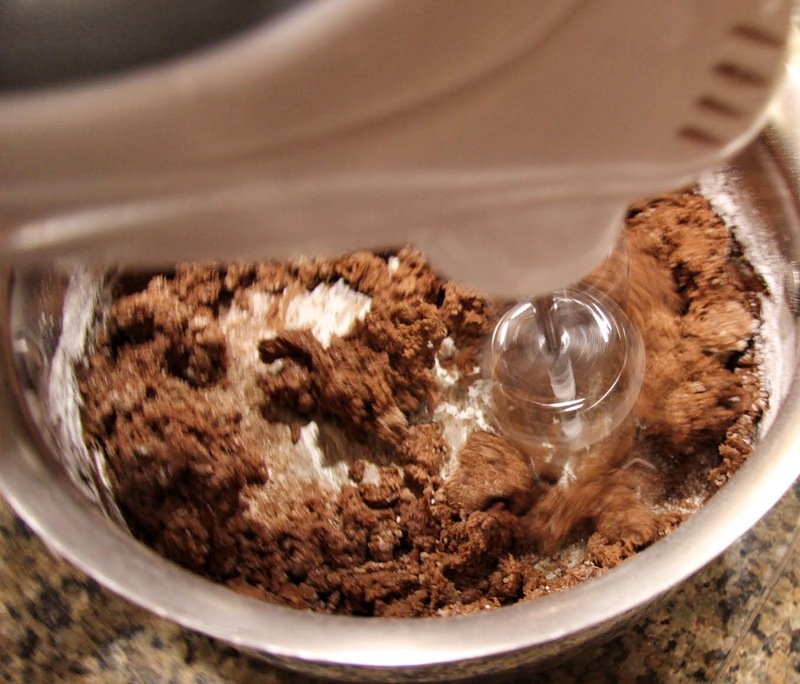 If it’s still too thick to spread, add a little more milk. Too thin? Add more powdered sugar. Spread the icing evenly over the cake and don’t wait… eat your first piece now with a cold glass of milk!